Career Guidance is one of the main components of higher education which provides the career education, information and guidance, development of employability and the career management skills for the undergraduate to be a qualified graduate one day. Career Guidance Unit of the University of Sri Jayewardenepura was established to help undergraduates develop their skills and capabilities which are required for coping with the demands of the world of employment and to develop lifelong learning ambitions. Success in career guidance depends on providing up to date data on training & employment opportunities & owning a right knowledge of available opportunities in the local and international training market. 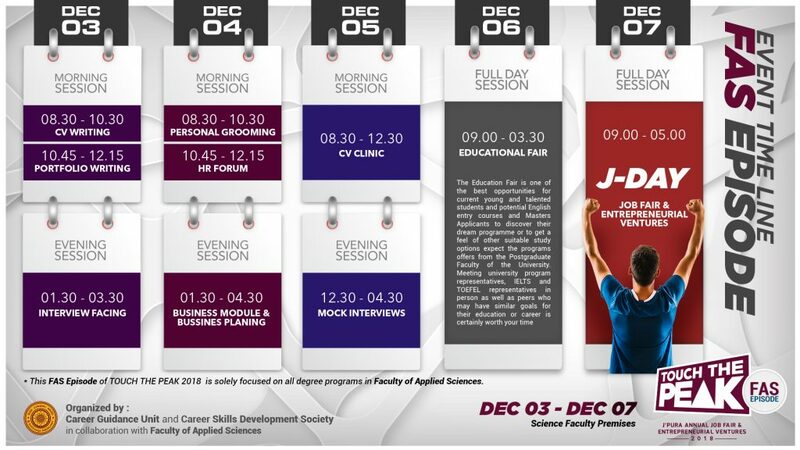 Therefore, the Career Guidance Unit conducts various types of workshops, seminars, training, and programs in the university to achieve the above objective. “TOUCH THE PEAK”, the annual job fair and workshop series is one of the programs specially scheduled to provide students with an opportunity to interact with state and private sector organizations with the objective of developing required Skills, Personality, Qualities and getting employment opportunities and to establish entrepreneurial ventures. The unit invites employers from the private sector and institutions to interview our graduates for job opportunities available in their organizations and facilitating infrastructure for innovative thinkers & entrepreneurs. Annual Job fair of the University of Sri Jayewardenepura is planned to be held separately for each faculty students, according to provide more facilities to occur job opportunities and ventures for relating their expertized knowledge requirements.